People from all walks of life from Bollywood film-star Amitabh Bachchan to Prime Minister of Bangladesh Sheikh Hasina paid their respects to the fallen stalwart. The news made a lot of headlines in all the Kolkata-based newspapers too. However, in their emotional state, some people might have gone a bit over the top. 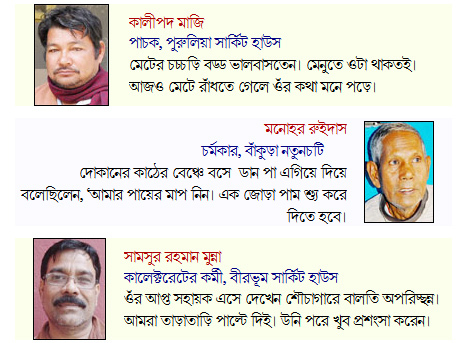 Anandabazar reports some comments of the common people in the newspaper today. (“The bucket in the bathroom was dirty. We changed it quickly. Later, he [Chief Minister, Jyoti Basu] was full of praise for us“). My honest question is this: if you had one chance to give an account of your last respect to one of the stalwarts of your state to the largest-circulated daily newspaper, would you freely say there was a dirty bucket in the bathroom under your charge? © 2010-2013 Bhalomanush.com. All rights reserved. This entry was posted in খবরাখবর, বাংলা, Bengali, culture by Anirban. Bookmark the permalink. You are right. Jyoti Basu was a successful C.M. but could you remember the case of Marichjnapi, Snaibari murder in Burdwan, the comments on Bantala case, barahnagar, withdrawn of English from primary education ect endless so on. He was controversial no doubt but public memory is selective and short. As for me, I don’t remember any CM before him and so I remember ALL aspects clearly! Thanks for your comments and also for reading. the same goes for me too. he was the only CM i had seen. before buddha babu came in that is. had he been PM? well, i dont know what he would have done. there were many jokes about the local call one makes from ‘narak’ (hell) to west bengal, during his tenure. but without a doubt he was an important politician of this country and a communist the likes of whom the country might never see. Thanks for your thoughtful comment here and your post on your blog. I don’t know how anyone would have done under the circumstances of the 1996 election, but the need of the hour was stability. Something we did not get that year. Anyways, here, I just wanted to make fun of how the newspapers were asking for “jonomot” and some of the comments they were getting.